A few weeks ago I saw some fun pumpkin pretzels, regular pretzels dipped in orange candy melts and decorated to look like pumpkins, in a magazine. I should have grabbed it right then because I haven't been able to find it since and I couldn't find it online either. That is until these cute chocolate dipped pumpkin pretzels popped up in my reader. And these are cuter that the original idea that I saw!! A perfect treat for Fall or Halloween. 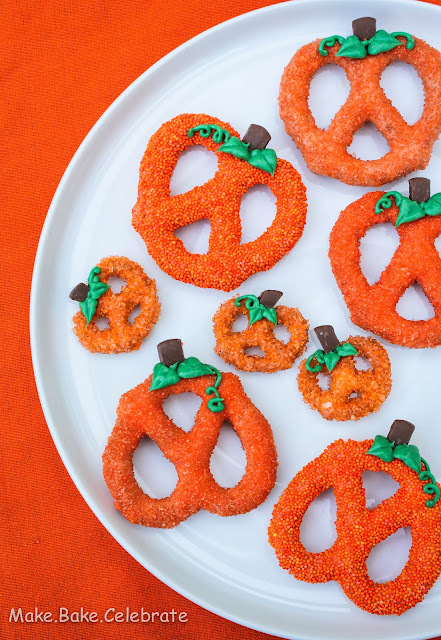 You can check out how to make pumpkin pretzels over at Make. Bake. Celebrate. I am so excited for fall treats! I help make snacks for my baby sisters pre-k class and they would love this! These are so cute! Love them for a Halloween or fall party. Thanks for sharing.